Talley Up! is a psychedelic New Orleans funk band featuring some of the finest players in Marin County, Ca including bandleader Jim Talley (Bob Weir, Eric McFadden, Karl Denson, Stu Allen) on keyboards and lead vocals, Tom Finch (Big Brother & the Holding Co., Pamela Parker, SF Airship) on guitar and vocals, Michael Pinkham (New Monsoon, Scott Law, Albino) on drums, Jen Rund ( Stu Allen, Mark Karan, The Real Sarahs) on bass and vocals as well as regular special guest Aaron Saul (George Clinton, Soul Ska, Vinyl) on alto sax. The band has released their first cd entitled “Funky Alchemy”. Recorded 24 track live at 19 Broadway in Fairfax by ace live recordist Bob Cogswell the 9 song 74 minute cd showcases the band’s instrumental songs and their amazing alchemy of funky improvisation and telepathic musical interplay. The current focus in the band are the vocals with 3 part harmonies. Mixing funky originals by Jim Talley with New Orleans classic hits from the Meters, Dr. John, Neville Bros., Allen Toussaint, Dumpstaphunk, Jon Cleary and Little Feat among others the band constantly stretches the limits of New Orleans funk to find new musical destinations and discoveries. Talley Up! has opened for Moonalice in a local festival appearance and performed with Karl Denson at the 2017 High Sierra Music Festival followed by an appearance at the 2017 For the Funk of It Festival in the High Sierras. Locally the band has performed 5 times recently at Phil Lesh’s Terrapin Crossroads in San Rafael and multiple shows at the Sweetwater Music Hall in Mill Valley including opening for New Orleans trumpet maestro Kermit Ruffins! In their home town of Fairfax the band has played extensively at 19 Broadway, the Iron Springs Brewery and Peri’s as well as regular appearances at Smiley’s in Bolinas and the Lagunitas Brewery in Petaluma. Talley Up! has also appeared regularly in San Francisco at the Tupelo in North Beach as well as Amnesia, Doc’s Lab and the Yerba Buena Gardens. Talley Up! brings together the dance mania that is New Orleans funk with extraordinary improvisation skills to take the music and the audience to higher realms with each successive show! 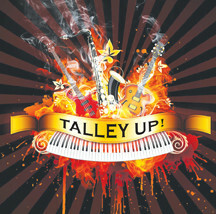 Veteran keyboardist Jim Talley and lead guitarist Tom Finch, both stalwarts of the Fairfax music scene, explore the psychedelic possibilities of New Orleans funk on “Funky Alchemy,” the debut CD from Talley’s quartet, Talley Up! With bassist Jen Rund and drummer Michael Pinkham ably holding down the rhythm section, Talley and Finch are free to take off on flights of jazzy improvisation on the album’s nine tracks, recorded live in July, 2015, at 19 Broadway in Fairfax. Be prepared for some concentrated heavy listening on these impassioned, mostly instrumental tunes, ranging in length from six to more than ten minutes. 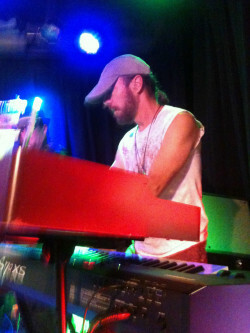 Talley is especially impressive on the organ, sounding like a Marin version of Jack McDuff. Although the album was recorded on 24 tracks in sparkling clear fidelity by Bob Cogswell, there are precious few audience sounds to give it the immediacy of being played in a nightclub rather than in a recording studio. Then again, there’s no external noise to detract from this impressive debut by a quartet fronted by two of Marin County’s finest unsung musicians.